You guys, I’m already off to a much better start on this summer’s Tell Me What to Read books. I mean, last year, I never wrote reviews of even ONE of the books. I like to set the bar low. 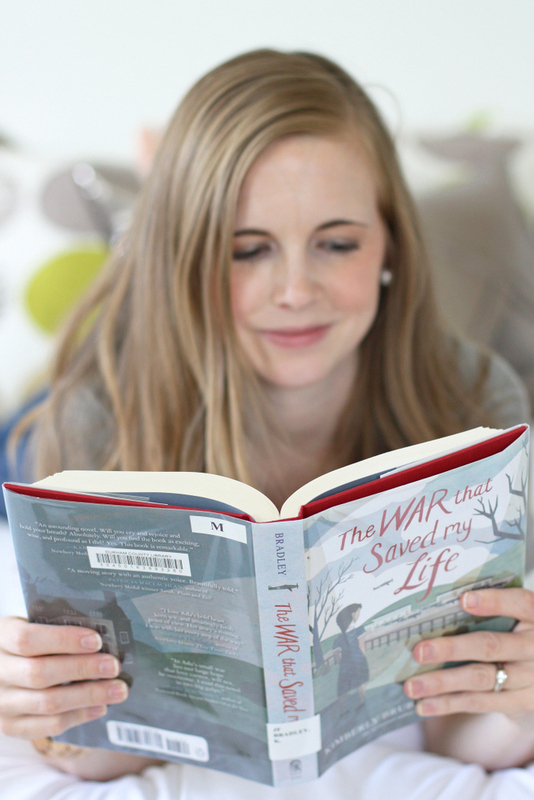 Happily, The War that Saved My Life set the bar high for the rest of the summer. I already knew of Kimberly Brubaker Bradley from reading Jefferson’s Sons several years ago (which I highly highly recommend) and I’d heard such glowing reviews of this book, that I couldn’t wait to get my hands on it. It didn’t disappoint. Ada and Jamie live with their mother in London. She works at a pub and is a pretty unfit mother. Ada, especially, takes the brunt of her mother’s cruelty because Ada has a mangled foot (she learns later that it’s a untreated club foot). Her mother is so embarrassed by it that she never allows nine-year-old Ada to leave the house, confining her to their one-room apartment at all times. Jamie, on the other hand, who is a few years younger, runs wild, spending most of his time roaming the city with other boys. As the book opens, Ada, home alone all day and tired of her mother’s cruelty, begins secretly teaching herself to walk, which is incredibly painful since her foot is basically upside down. And then, one day, he comes home from school to inform his mother and Ada that the children of London are being sent out to the country to protect them from Hitler’s imminent war. Their mother agrees to let Jamie go, but insists that no one would want Ada with her “ugly foot.” But Ada refuses to be left behind and the next morning, she sneaks out with Jamie and the two of them board the train to the country. When they meet some of the neighborhood children, Ada realizes that most of the other children who have seen her at the window for years have always assumed she’s simple. It quickly becomes obvious that, while Ada isn’t simple, her life experience is incredibly small. She asks Jamie what that green stuff outside the train is (it’s grass) and when they stop, she has to ask Jamie how to use a toilet since her mother has only ever let her use a chamber pot, too ashamed to let her use the public toilets in the apartment. In the bathroom, as she sees herself in the mirror for the first time, she realizes how filthy and wan she and Jamie both are, and it is confirmed when they arrive in the country town and they are the only two children not selected by townspeople to be cared for. The woman in charge puts the children in her car and drives them out to a house where Susan Smith lives alone. Her best friend has recently died, leaving the house to Susan, and Susan is in deep mourning. The two women argue and Susan finally reluctantly agrees to care for Jamie and Ada. The children are certain that Susan is rich, since they have three full meals a day and Susan buys them new clothing. And when they hear she gets a small allowance to care for them, they suggest she take in more children, so she can be really wealthy (a suggestion that amuses Susan who knows that the money is a very small amount). Ada also discovers that her club foot isn’t her fault and is surprised to realize that most people don’t seem particularly bothered by it – a few people remark on it, but no one seems to share her mother’s view that she should never be allowed to leave the house (a novelty that takes Jamie a while to adjust to). And so Ada’s world grows bigger and bigger, as she learns to read, develops a few cautious friendships and, best of all, discovers horses. But she worries that this new life can’t continue. When the war is over, will she have to go back to her mother? I was familiar with the children who were sent out of the cities during the London Blitz (there was an exhibit about it at the Imperial War Museum when I was on Study Abroad in London back in 2006), but I hadn’t read any books – fictional or otherwise – about what it might have really been like for them. I loved the portrayal of Jamie, who was devastated early on to be out of London and sobbed daily to return home, despite how bleak his life was there. And Ada, who is afraid of being sent away, nevertheless struggles mightily to reconcile the way she views herself based on her mother’s behavior with the fairly regular girl Susan sees her as. And watching Ada and Jamie learn new things is fascinating but not over-the-top (Susan quickly learns to explain everything from the absolute beginning – when she’s cooking eggs, she explains the shell, yolk, and white, and then how to crack it). This was one of those books where I realized about half-way through that I had no idea how the story was going to unfold. There were a bunch of things going on – Ada’s growing understanding of the world and herself, the war and bombings, the looming fear of returning to her mother, her friendship with the wealthy neighbor girl – and they all worked together beautifully. There wasn’t an obvious story arc; despite the backdrop of the war, there was no timeline or foregone end point for this story. And the writing is just so excellent here. You feel acutely Ada’s confusion, anger, and despair over her circumstances and her difficulty making sense of her life both in the present with Susan and in the past with her mother. It’s by turns heart-breaking (the scenes at Christmas when Ada can hardly contain her huge emotions are tear-jerkers) and hilarious. I kept making notes about great lines (but then I returned my copy to the library and packed everything up, so . . . I can’t tell you what those great lines were. Just rest assured there were many). I didn’t think it was quite as good as Jefferson’s Sons, but it’s definitely a good addition to a WWII historical fiction collection. Also, there is a sequel in the works, but this is a book that stands solidly on its own. This book was pretty amazing, I agree. Since you are the only other person I know who has read it (and is not a kid) I am wondering, do you think Susan's friend was a girlfriend in the romantic sense? I don't think anyone but an adult might question that but I felt it was interesting if that is how Brubaker Bradley has written her character. Yes! I just finished the book and came back to read Janssen's review. There was no doubt in my mind that Becky was Susan's partner and that that was what caused the rift between Susan and her father. I thought that was all handled beautifully and subtly. I'm so thrilled to hear that there is a sequel in the works, as my only complaint about this one was that it ended too quickly. I loved this one too; so glad you recommended it! And after searching for it forever I finally found Jefferson's Sons and read it the same week. Both are excellent and so thought-provoking. I agree that Jefferson's Sons is slightly better but really I loved both. I really loved this book!! I'm off to check out Jefferson's Sons. I knew I could count on your for some good book recs:) I may actually have time to read this July! I think I'm finally going to put this one on hold (been so many good books coming out lately!). Excited to read it! I'm so glad you liked this one! I recommended it!! Excited to hear there is a sequel in the works! I loved this book! I should have read the book jacket before reading the book because I totally didn't realize that the author wrote Jefferson's Sons, which is another book that I read based on your recommendations and loved. Just picked this one up at the library yesterday and after reading this review, can't wait to dive in! The pressure is on now! I love Cheaper by the Dozen, the Mortal Instruments series, Jim Gaffigan's books, and Sophie Kinsella. This book sounds great and reminds me of one of my favorite books called Goodnight, Mr. Tom (by Michelle Magorian). It's a book about a little boy named William who is evacuated to the countryside during WWII and sent to live with this cantankerous old man and is about the relationship that they develop as William learns what it's like to be loved (he's from an abusive home) and as Mr. Tom softens up a bit. It's fabulous. And I also recommend Magorian's book Back Home, which is about a girl adjusting to life back in London after the war and after being evacuated. Ooh this sounds like a great book, i love historical fiction but especially more modern history if you know what I mean. It's been almost 2 decades since I last read it, but Goodnight, Mr. Tom is another book about children being evacuated to the countryside. As a child, I loved this book. Absolutely loved this book. Thank you for the recommendation.